Onstave is a web platform for contemporary art music publishing, with some features to promote new performances of the published works. What is a performance project? The performance project's goal is a new performance of a piece published on onstave.com. Any registered user can create a performance project and join it. The author of the project can declare, at the time of its creation, his/ her willing to funding the project. How does performance project work? 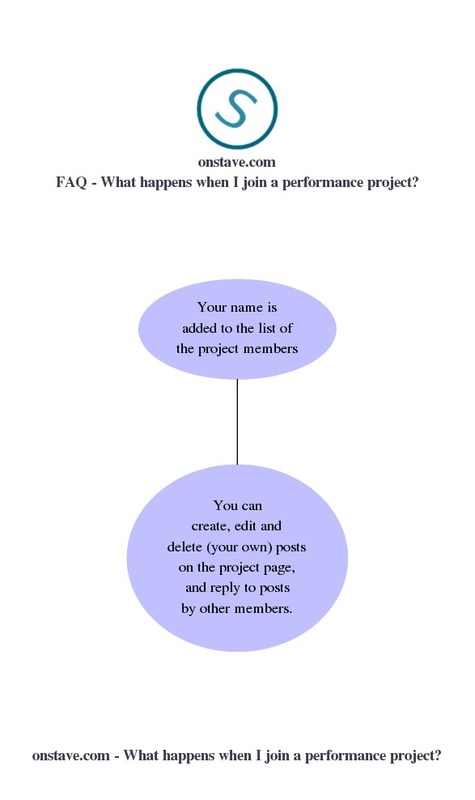 Any registered user can create and join a performance project. The project author can declare his/her willing to funding the project, at the time of its creation. The project members can discuss about the project by creating topics, writing comments and replies on the project page. Goal of the project is to realize a new performance of the piece. How do I create a new performance project? Click on "Account menu -> Add a project". Select a work from the list (it includes all published works). Select a value for the funding option (optional). What happens when a performance project is created? The author of the project is automatically set as the project manager. The project is published and accessile to all users, even anonymous, while only registered users can join the project. How do I join a performance project? Click on "Account" -> "Active projects". Click on the title of the project you wish to join. Click on "Join to this project" then confirm your choice. What happens when I join a performance project? Your name is added to the list of the project's members. You can create, edit and delete (your own) posts on the project's page, and reply to other members posts. How do I unsubscribe from a performance project? To unsubscrube from a performance project, access the page of the project from which you want to unsubscribe, then click on "Unsubscribe from group". How do I unsubscribe from a project I created? Remove other members from the project. Access the profile of the user you want in your team. Click on "Become [username] team member. How do I remove a relationship? Click on "remove" link, under the section "Your relationships to this user"
On the confirmation page click on "Yes" to confirm your choice. How does publishing process work? Registered composers can upload their works through a web form. Since onstave is a web site for contemporary art music publishing, we don't publish automatically the works submitted. As a general orientation, innovative styles are strongly encouraged.